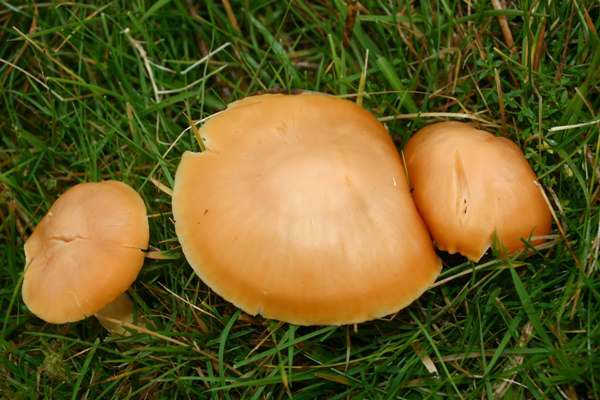 One of the largest of the waxcap fungi, and commonly known as the Meadow Wax cap, Cuphophyllus pratensis is a common find on cropped grassland and upland pastures. It appears from late August until December and is generally considered edible although not highly prized. In some fairly recent field guides you may find this species listed under one of its many synonyms, which include Hygrocybe pratensis, Camarophyllus pratensis and Hygrophorus pratensis. 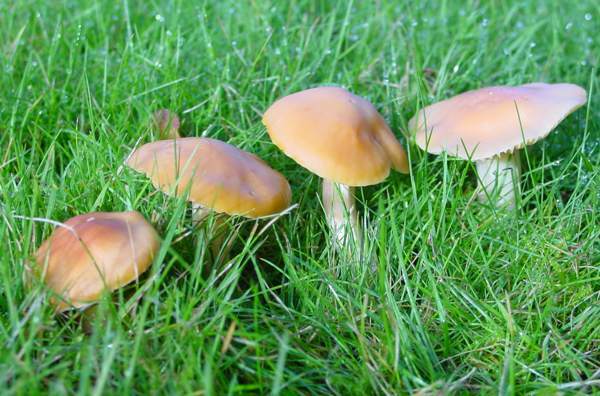 Widespread and fairly common in Britain and Ireland, particularly in upland areas on acidic soil, the Meadow Waxcap is one of the few Hygrocybe species that can tolerate small amounts of fertiliser being applied to its grassland habitat. 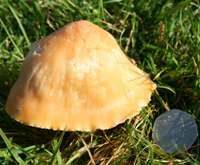 The Meadow Waxcap often forms small groups or lines of mushrooms but also occurs as widely scattered singletons. It was not until 1914 that the famous American mycologist William Alphonso Murrill (1869 - 1957), writing in the journal Mycologia, transferred this waxcap to the genus Hygrocybe, establishing the scientific name as Hygrocybe pratensis. In 1985 this species was transferred to the genus Cuphophyllus by French mycologist Marcel Bon, and the name Cuphophyllus pratensis has since become its generally accepted scientific name. 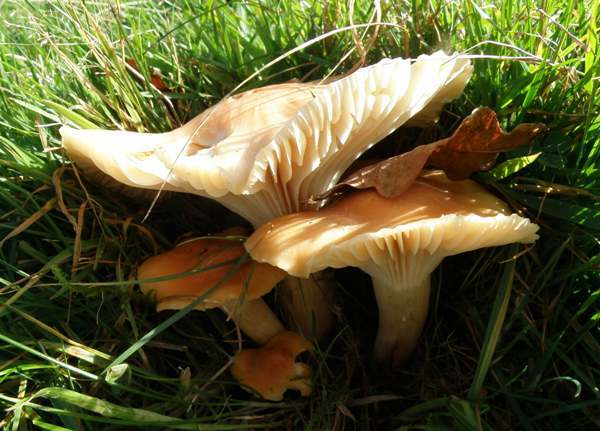 Two varieties of the Meadow Waxcap occur in Britain. The nominate form Cuphophyllus pratensis var. pratensis, pictured above and at the top of this page, and described in detail below, has a peach-coloured cap and stem, while Cuphophyllus pratensis var. pallida (also pictured second from top of this page) is pure white. Being a large, conspicuous, attractive and edible mushroom, Cuphophyllus pratensis has caught the eye of many great mycologists down the ages. 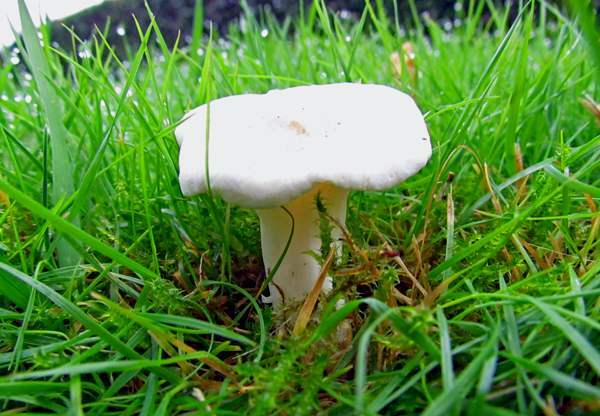 As a result it has acquired several synonyms including Agaricus pratensis (Pers. Gymnopus pratensis (Pers.) Gray, Hygrophorus pratensis (Pers.) Fr., Camarophyllus pratensis (Pers.) P. Kumm., and Hygrocybe pratensis (Pers.) Murrill. As a specific epithet pratensis is much easier to fathom out provided you have had a basic grounding in Latin. For those who have not, you will nevertheless be unsurprised to know that it it translates to 'of meadows'. That's where these chunky waxcaps are most often found. 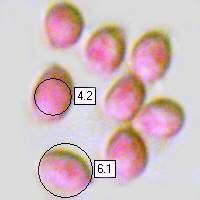 The cap is slightly umbonate, 2 to 7cm in diameter and variable in colour from pale yellowish to buff or sometimes pinkish-red. Apart from during rain, the caps feel dry and smooth. As the fungus ages so the cap fades and its flesh turns from white to a pinkish buff. 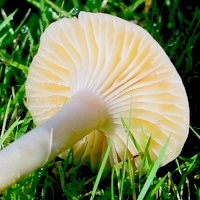 Thick, broad and distant, the cross-connected whitish gills of Hygrocybe pratensis are decurrent - often extending more than 1cm down the stem..
With age the gills become more cap coloured. White at first and later cap coloured, the solid stem of the Meadow Waxcap is stout and becomes hollow with age. Ellipsoidal or teardrop-shaped to subglobose, smooth; 5.5-7 x 3.5-5μm. Closely mown grassland where artificial fertilisers have not been spread in large quantities (although this waxcap will tolerate small amounts of fertiliser), and in some sheep-cropped upland pastures, notably near roadsides. August to December in Britain and Ireland. 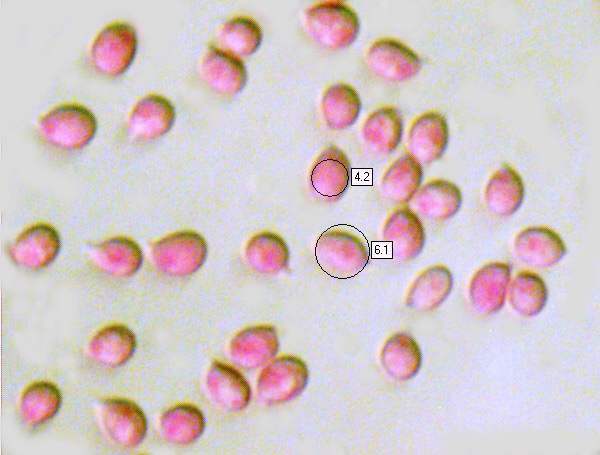 Porpolomopsis calyptriformis has a pink pointed cap and the cap invariably splits as it expands. On a Europe-wide scale most waxcap fungi are now quite rare, and so although in western Britain many of the acid-soil species are still plentiful most mycologists deplore the suggestion of these lovely fungi being gathered to eat. 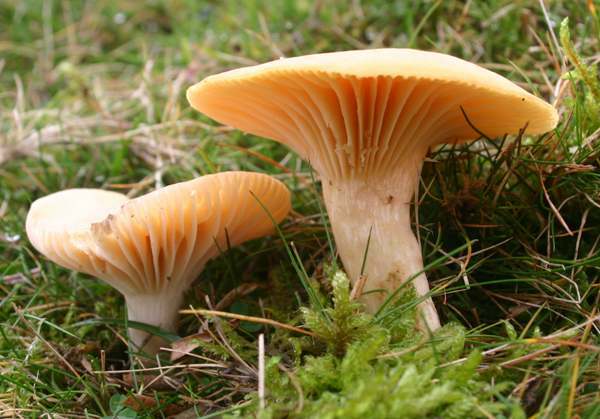 Nevertheless, the Meadow Waxcap is quite well known as an edible mushroom, and in areas where there are enough of these fruitbodies to make collecting them worthwhile there are a few fungiphages who rate them very highly indeed. Being fleshy and containing plenty of moisture (the latter a characteristic of waxcaps), Meadow Waxcaps can be fried in their own juices. Simply drop them into a hot pan with a bit of salt and pepper; there is no need to add fat or oil. When young and fresh the texture is firm, and so these wild mushrooms are good served with either meat or fish dishes. One other plus point for this grassland mushroom (in its var pratensis form shown immediately above, of course, not the very rare var. pallida) is that it is difficult to confuse it with any of the poisonous gilled fungi that you are likely to find well away from trees.